Pharmaceutical Name: Herba agastachis seu, Herba pogastemonis. Botanical Name: 1. Pogostemon cablin Blanco; 2. Agastache rugosa (Fisch. et Mey.) O. Ktze. Common Name: Agastache, Pogostemon cablin. Part Used & Method for Pharmaceutical Preparations: The aerial parts of the plant are gathered in summer or autumn, cut into pieces and dried in the shade. Properties & Taste: Pungent and slightly warm. Functions: 1. To transform dampness; 2. To dispel summer-heat; 3. To stop vomiting. 1. Dampness blocking the spleen and stomach manifested as epigastric and abdominal distension, nausea, vomiting and poor appetite: Agastache (Huoxiang) is used with Atractylodes rhizome (Cangzhu), Magnolia bark (Houpo) and Pinellia tuber (Banxia) in the formula Buhuanjin Zhenqi San. 2. 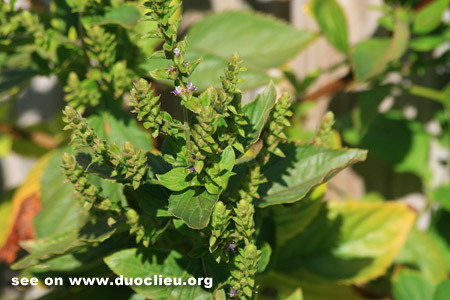 Internal injury caused by raw and cold food and invasion by exogenous wind and cold in summer manifested as chills, fever, headache, epigastric fullness, nausea, vomiting and diarrhea: Agastache (Huoxiang) is used with Perilla leaf (Zisuye), Pinellia tuber (Banxia), Magnolia bark (Houpo) and Tangerine peel (Chenpi) in the formula Huoxiang Zhengqi San. 3. Vomiting: a) vomiting caused by turbid dampness in the spleen and stomachAgastache (Huoxiang) is used alone or with Pinellia tuber (Banxia) and Fresh ginger (Shengjiang); b) vomiting caused by damp-heat in the spleen and stomachAgastache (Huoxiang) is used with Coptis root (Huanglian), Bamboo shavings (Zhuru) and Loquat leaf (Pipaye); c) vomiting caused by weakness in the spleen and stomachAgastache (Huoxiang) is used with Pilose asiabell root (Dangshen) and Licorice root (Gancao); d) vomiting caused bypregnancyAgastache (Huoxiang) is used with Amomum fruit (Sharen) and Pinellia tuber (Banxia).